Unlike most other options, Sky Ox aviation oxygen systems do not require a bulky flow meter in each line—nor the inconvenience of keeping it vertical to be read. What’s more, Sky Ox portable oxygen systems feature our exclusive adjustable-flow regulator. Only Sky Ox allows the pilot, not passengers, to control oxygen use because the pilot is most capable of accurately monitoring the duration of an oxygen cylinder. Each Sky Ox portable oxygen system comes ready to use with a two-outlet adjustable flow regulator, two oxymizer cannulas and one mask. Four-outlet regulator systems also are available. Choose either aluminum or steel tanks. Aluminum tanks are available in 4, 6, 9, 15, and 24-cubic foot capacities. Steel tanks have capacities of 20 or 40 cubic feet. Use with the oxymizer cannula, and you can increase the duration of a tank from five to more than 46 hours. On average, the oxymiser cannula will nearly triple duration compared to a mask. Please refer to each tank's specifications for further details. Padded carrying bags help protect the system, which is completely portable. 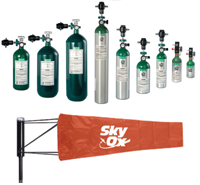 So when you’re looking for dependability in a portable aviation oxygen system, choose Sky Ox—and breathe more easily.